The toys hit the road in Disney•Pixar’s Toy Story 4, coming to theaters on June 21, 2019. A new trailer for the film debuted this morning. 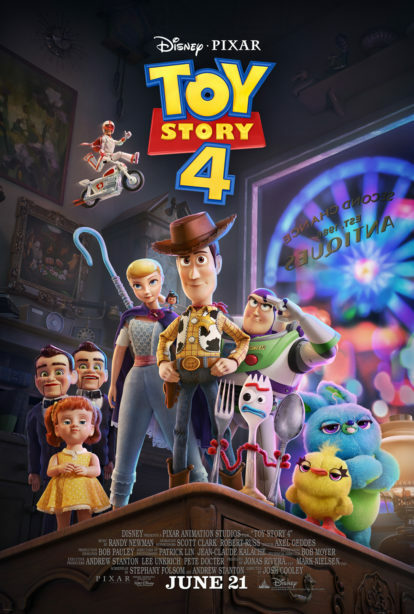 Today, the Toy Story 4 filmmakers also welcomed Christina Hendricks, Keanu Reeves and Ally Maki to the toy box. They are lending their voices to three new characters: Gabby Gabby, Duke Caboom and Giggle McDimples. Gabby Gabby (voiced by Hendricks) is an adorable, talking pull-string doll from the 1950s. But unfortunately for her, a manufacturing defect in her pull-string voice box has left her sounding anything but adorable. She has spent more than 60 years forgotten in the depths of a jam-packed antique store—her only companions are a band of voiceless ventriloquist dummies. Gabby Gabby knows someone will want her if only she can find a working voice box to repair hers. Reeves lends his voice to Duke Caboom, a 1970s toy based on Canada’s greatest stuntman. Riding his powerful Caboom stunt-cycle, Duke is always prepared to show off his stunt poses with confidence and swagger. However, Woody learns quickly that Duke has an Achilles heel: He has never been able to do the awesome stunts advertised in his own toy commercial. For years, Duke has been sitting in an antique store, constantly reliving the failures of his tragic past. Also introduced in the new trailer, Benson is a classic, antique ventriloquist dummy, and Gabby Gabby’s right hand. He leads a small group of ventriloquist dummies that serve as Gabby’s henchmen. With no person to give them a voice, these silent toys patrol the antique store with a looming quietness that is inherently unsettling.